Milly (Mandy Moore) is unlucky in love, unlike her two sisters, Maggie (Lauren Graham) and Mae (Piper Perabo). 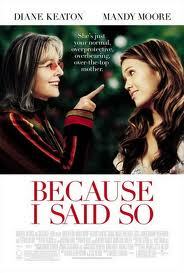 Luckily, she has the most annoying mother in the world, Daphne (Diane Keaton) to meddle for her. Daphne sets up an internet profile for a mother seeking a mate for her daughter, and a montage ensues. Of course, the only suitable candidate after a line of ridiculously unsuitable ones, is a handsome, rich architect; Jason (Tom Everett Scott). But there is a musician, Johnny (Gabriel Macht) in the bar where Daphne meets the candidates, and he finds it quite amusing. He sets himself up to meet Milly; Daphne sets Milly up to meet Jason. And things get complicated. Why, Dianne Keaton, why? You are such a wonderful actor with so many top roles to your name. Did they give you a lot of money? I really hope so, or perhaps they had some incriminating photos or something. I hate to think that you read the script and thought the film was worth making. It was appalling. Cringeworthy. Terrible. In so many ways terrible. I usually only shout at the television when politicians are on; but I screamed at this. So very, very bad. I regret not turning it off; the only good thing was seeing Gabriel Macht wearing the most stupid clothes and acting very much differently to his character in Suits. That made me laugh. The rest? Blech.